Today I'm sharing this really awesome leaf card by Lydia! Lydia used the small bold leaf stamp from the Falling into Autumn stamp set. She stamped all those pretty leaves overlapping in a circle to create a fun and festive wreath. Then she added on red dots with copic markers. Such a fun idea! 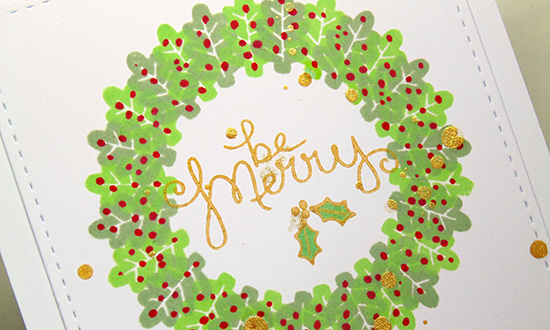 The sentiment "be merry" and the little holly leaf are from the Christmas Delivery set and they add just the perfect finishing touch along with some gold splatters! To see more projects by Lydia, make sure to visit her blog, Lydia Evans Design! Here's an image of the set she used - You can see it's really meant for Autumn but I love the idea of using it for Christmas too! 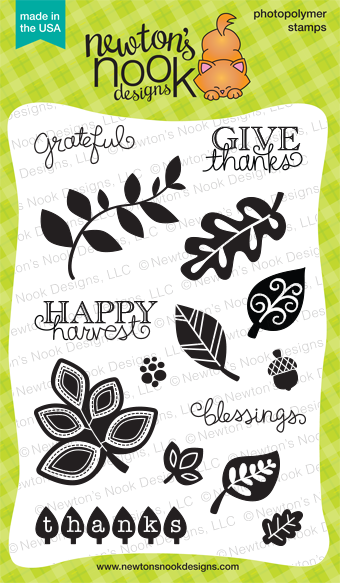 If you like this stamp set - make sure to check out our Falling into Autumn board on pinterest - it's jam packed with inspiration! This card is so pretty and I love how Lydia used a leaf stamp to create the wreath, so creative! super pretty card, beautiful stamp! This is stunning! So creative!